Route 8/Route 28 North: To Route 28 North. Take Exit 8 (Fox Chapel Road). Bear left off ramp toward Fox Chapel Road. Turn right at light onto Fox Chapel Road. Straight through the light onto Old Freeport Road (road will then bear left) and follow 1/10 mile. Turn right onto Chapel Harbor Drive and go through the tunnel under the train tracks. Keep right on Chapel Harbor Drive and follow toward and along the river (past townhouses). Park Place Office Building will be on your right, (after the Gazebo). Parking entrance on right immediately after building. Suite 300 is on the 3rd floor. Route 28 South: From Rt. 28 South, take Exit 8 (Fox Chapel Road). Turn right onto Fox Chapel Road, then follow only italicized portion of Rt. 28 North directions above. 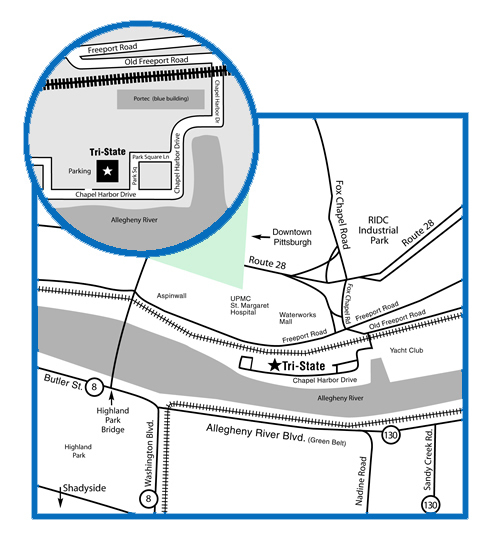 Pittsburgh: Take Fort Duquesne Bridge to Interstate 279 North. Take Exit 7C to Rt. 28 North. Follow directions from Rt. 28 North. Shadyside/Oakland: From the Highland Park Bridge, bear right onto Rt. 28 North. Follow directions from Rt. 28 North. Turnpike (from East): Exit 48 (Allegheny Valley) to Rt. 28 South. Follow directions from Rt. 28 South.